Ever since the remake was announced, excitement has been building over who the next generation of F4 will be. Kris Wu (Journey to the West) seems to be a popular choice to play the hot-headed leader of the group. When you add Luhan (Fighter of the Destiny), Huang Zitao (A Chinese Odyssey) and Lay (Operation Love) into the equation and consider that there are exactly four of them, all of whom are either former or current members of the k-pop band EXO, it already sounds too good to be true. 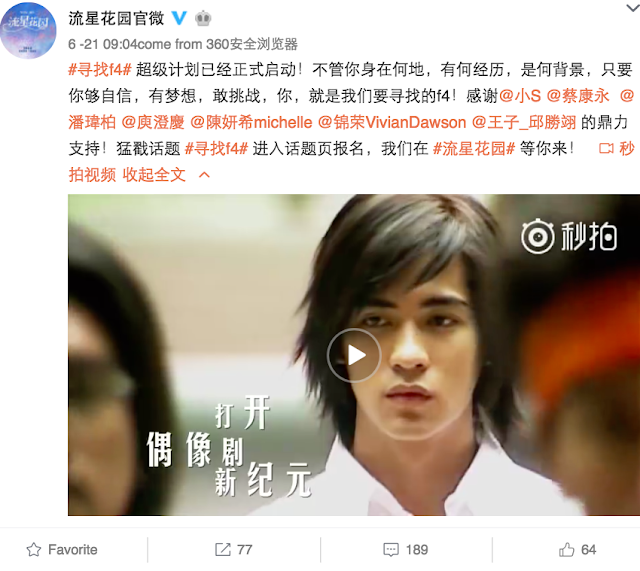 On June 21, a casting call was announced through a video and a weibo post saying, "#FindingF4# The extravagant plan officially begins! Regardless of where you are, your experiences or background, as long as you are confident enough, have dreams and dare to take the challenge, you, are the F4 that we are looking for! Thank you for your support @XiaoS @KevinTsai @WilberPan @HarlemYu @MichelleChen @VivianDawson @WangZi! Trending topic #FindingF4# Apply through the link, we are waiting for your arrival at #MeteorGarden#." So there you have it, the next F4 could very well be you! Because I'm little miss curious, I actually clicked on the signup link to find that there are a few requirements. You have to be aged 18 - 24, between 180 - 185 cm, healthy and have presentable facial features. I am not sure how to signup beyond that but they have added that people having issues can also send an email (see above) along with their pictures and video. Producer Angie Chai who created the Meteor Garden phenomenon more than 16 years will be working her magic once again for the remake. It's no surprise that remakes can sometimes go horribly wrong, which is why Angie Chai shared that she has been deliberating on how to make a production that will sit well with the young crowd (born 2000' onwards). Filming is expected to begin later this year and slated to premiere during the summer of next year. Angie Chai also gave an exclusive interview with Sina (parts of which have been translated below). Upon hearing that netizens have been pushing for Kris Wu as Dao Ming Si, Luhan as Hua Ze Lei, Huang Zitao as Mei Zuo and Lay Zhang Yixing as Xi Men, Angie Chai laughed, "I think that the netizens are adorable, it's not a bad match up, if the budget is enough and they are willing, then come!" When asked what role Jerry Yan can play if he cameo'd, Angie Chai responded, "It'll be too awkward, he has played Dao Ming Si already, how can he cameo? He is too young to play the dad but Dao Ming Si doesn't have an older brother, how? How about Dao Ming Si dreams that he is ten years older with a family and married to Shan Cai, it can only be that." Even though Angie Chai seems reluctant on the possibility of a cameo, she has clearly stayed in touch with the former Meteor Garden stars and even saw Jerry Yan on her birthday so if the story permits, a cameo certainly doesn't seem out of the question. So if netizens had their way the F4 would basically be an EXOreunion? Let's not. Hope some of the F4 are talented newcomers. It would be a great opportunity for them. i really want EXO lol Meteor Garden has always succeeded even without the best acting so I feel like it could definitely work. From the looks of it, it's gonna be impossible though, not counting whether the four would even be willing or allowed to work together but just their fees are probably exorbitant and the casting calls would be pointless if they don't go with newcomers. Somehow I think the EXO members fit their respective assigned roles LOL. Except for Lay, that is. Can't imagine him as a play boy but who knows? my first ever drama was Japanese F4 and Hana Yori Dango manga, love it every bit of it and I can watch it again. I can't wait for EXO F4 2018, hoping that Zhao Liying will be in it. Kris and Zhao makes a good team. I think that the old cast should absolutley be involved in some way. Many of meteor garden fans feel a two decade strong attachment to the original cast, so excluding them completely would feel like a betrayal. I am sure there are endless possibilities and scenarios for cameos or even longer contributions. The new F4 could in some way be relatives to the original ones (i mean the important families are still the same). they can bring Jerry Yan if they want...well 1992 version for ItaKiss's female lead (forgot her name) did the cameo as nurse in ItaKiss remake..weird because there is 2 same charater but remake just a nurse doing an internship while the old character is a senior or head of nurse, something like that...and the remake is superb. got 2nd season and a film.